Michael M three stones rings bring forth vibrant sophistication to your loved one. 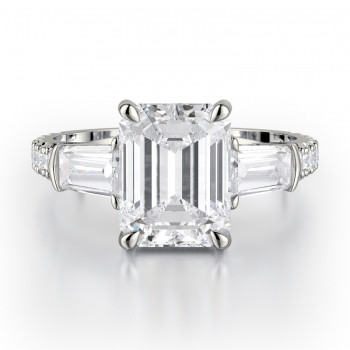 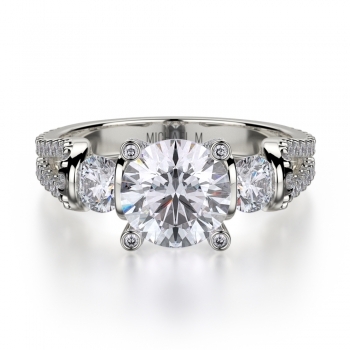 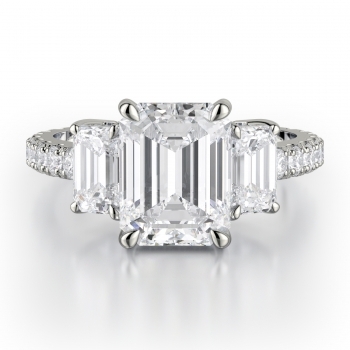 The brilliance of the center stone is accentuated by two radiant side diamonds that create a stunning visual effect. A great alternative for the women who desire more than one center stone, the three stone engagement rings of Michael M provides a truly awe-inspiring and unique look. For brides not afraid to “Live More,” the three stone engagement rings from Michael M can be found in a dazzling array of pieces covered in an amazing assortment of brilliant hand-picked diamonds. 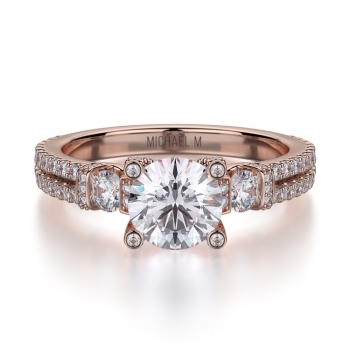 Crafted using only the finest precious metals including 18-karat white gold, yellow gold, rose gold, platinum 950, and only diamonds with a minimum of a G-rating, Michael M engagement rings are every bit as well-made as they are beautiful. On display today in pieces that range from modern, chic, and straightforward, to models that glow with a classic vintage feel, the perfect three stone engagement ring for any bride-to-be is sure to be available today from Michael M.with a classic vintage feel, the perfect three stone engagement ring for any bride-to-be is sure to be available today from Michael M.
Available today, at an authorized retailer near you, are dozens of the most stunning three stone engagement rings crafted by the master designers at Michael M. Included in the vast selection of three stone engagement rings is Michael M’s Trinity R422-2whose sheer elegance is hard to miss. 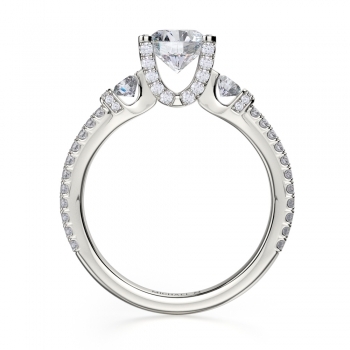 The ring’s stones are held together in a daring design. 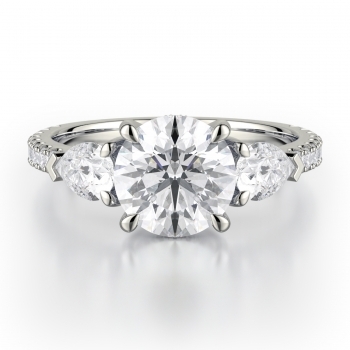 The Trinity’s intense beauty is visible from all angles and includes a pave of side diamonds in addition to its three stone center. Also available, Michael M’s Princesse R476-1. 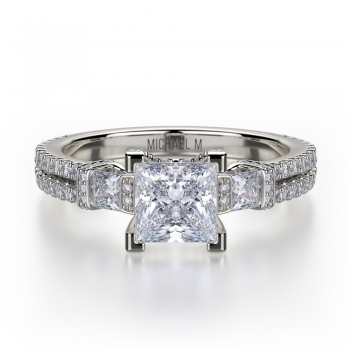 Showcasing exquisitely shaped princess cut dazzlers, this ring also has an ever so slightly split shank and a micro pave of diamonds sure to enchant all brides-to-be. 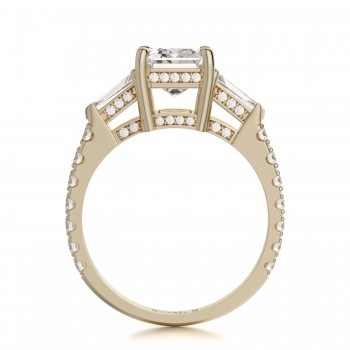 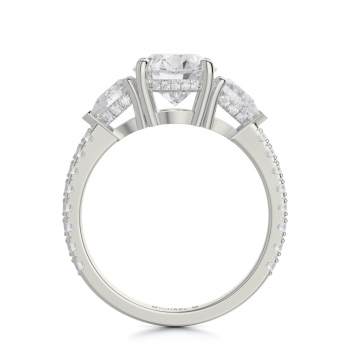 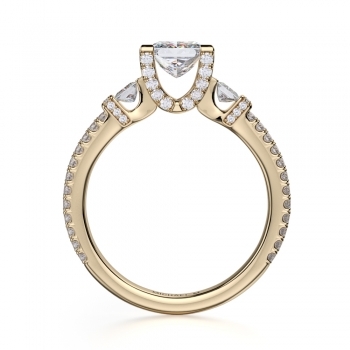 Merging classic elements with modern style, Michael M has quickly won the international adoration of many. Founded in 2008 by designer Michael Meksian, the highly-reputable brand has established itself as one of the highest luxury designers of both bridal and fashion jewelry. 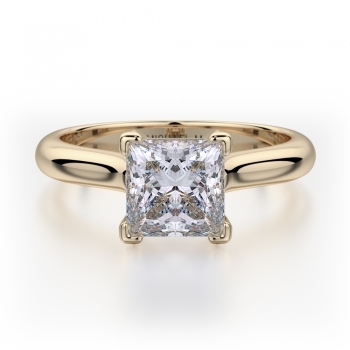 Included in the many items they craft, Michael M specializes in engagement rings, men’s and women’s wedding bands, necklaces, earrings, bracelets, and fashion rings. 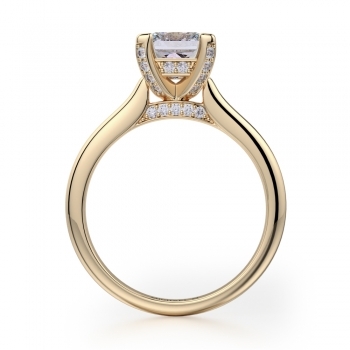 Michael M designer jewelry has demonstrated unparalleled craftsmanship and innovative designs sure to please men and women of all tastes. In pursuit of creating unmatched jewelry, Michael M takes a “diamonds over everything” approach to all the items they craft. As leaders in innovation for the jewelry industry, the craftsman at Michael M emphasize the use of quality precious metals and jewels in their designs and perfectly fuse technological advances with traditional design techniques.